Swamp Suburbia: Hay and Heat! I love getting hay. It's very invigorating, or something along those lines. 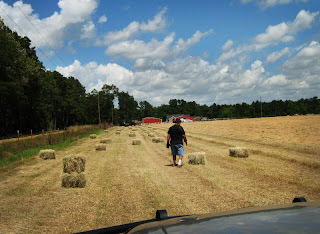 When we go and pick up hay we try to get around 200 bales. We normally go about three times before the spring and summer is up. That way we are well stocked up for the winter. Last year we had about 400 bales and we made it with about 10 to spare! Between my father in law and me we have 18 horses here. That is about 10 too many! But non the less they all need to be fed. So, we go and get them hay, and lots of it. It's a dirty job, but some one's got to do it. This time we went on a Monday afternoon Which means that all of our manual labor was working at their day jobs. Except for me, the cowpokes, Paw Paw, and the homeless man who lives in the camper by the barn. So, we gathered everyone up and drove on out to the field. It was a pleasant day, just shy of 95 degrees and about 80% humidity. Good southern weather. Our hay here is strictly grass hay and it's funky looking. 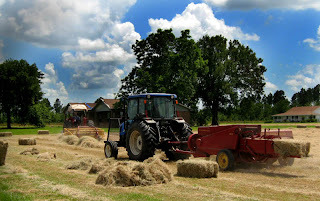 I was used to looking at a nice timothy alfalfa mix hay and then saw Bermuda grass hay. It's a shocker. I called it straw for a long time. But you can't beat 3 bucks a bale now can ya!! My cowpokes love the tractors. You can see how dry it's been down here, just look at that dust!! My Cowpokes love this part of the hay process. The big tractors. This man that was driving this tractor baled this field for us and one other guy. He had a bunch of hay left over. He told us that he was going to round bale it and feed it to his cows. He then told us that a lot of his costumers don't want square bales anymore. I told him that we will always want square bales and to always call us. That is strange, I guess people don't have the room for storage? I am not sure why they would want round bales, unless they have cows. Well, onto our loading. Mr. Cowboy is our normal stacker, but we had to enlist our homeless man. Well, technically he is not homeless, he is more of a drifter. He lives in my father in law's camper. We call him Mr. William and he is wonderful. He weed eats and keeps the barn super clean. We hardly ever see horse poop on the ground in our barn. He feeds our animals when we are gone, and he sprays our fence lines and ditches. He does all this just for a place to stay and food. Well, I give him some money every now and then, he really has been a big help to us here. He is a hard worker. I think he is like 60 years old? I am not sure, but he is around that age. 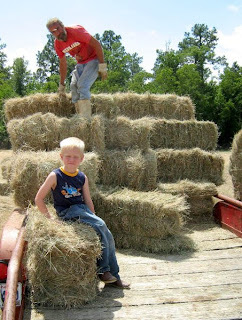 He would toss the hay up onto the trailer and then jump up there and stack it. He is one tuff guy. 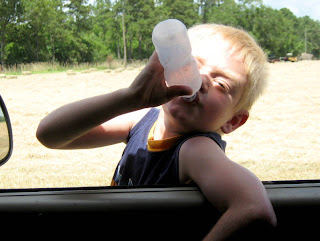 When he first came here he didn't have any clothes or shoes, so we went through all our stuff and gave him a bunch. I could not imagine living on the move like that. Oh, and don't worry, I Googled him to make sure he wasn't some weirdo. He just is a drifter. But anyway back to hay. After a short drink break, we kept on loading them up! I even jumped out of the driver's seat to toss a few up on the trailer too. This is what I see the entire time. I am not a very good driver. I get side tracked really easily. I will start to day dream while driving 2 miles per hour down a lane and the hay tossers will have to yell at me to stop. A bit ADD I think. There was about 200 bales we picked up. It didn't take us very long. Mr. William and my father in law did a great job. After they stacked it Big Cowpoke likes the jump up top to help toss over the ropes to tie the hay down. He is all big and tall up there. 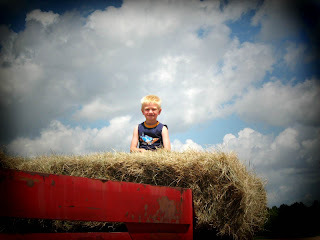 Maybe by the time he is 10 he will be able to drive us around the hay field. 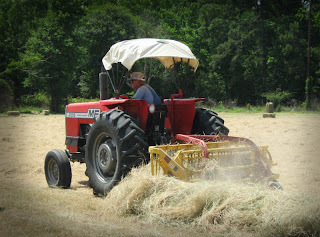 When we got home we were all too tired and hot to unload all that hay, so we just backed it up into the barn. The next morning Mr. William got up and unloaded it all himself. He is amazing! I hope he never wants to drift away from here. He has spoiled me with all of his help! After this hay trip we did one more and we have about half of our hay storage for the year! That is a good thing considering we have not had much rain since the first cutting. This weather is just not acting right these days. OMG, $3 a bale? Are you kidding me? I was at the farm store today and alfalfa was $20.95!!! I paid $11.50/bale for it 5 months ago. It's insane. I might switch My Boy to grass hay. 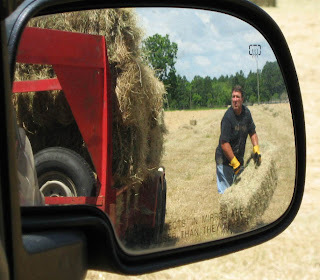 The better quality grass hay from the eastern side of our state is still $17 a bale right now. Local grass hay runs from $5 for last year's cuttings (what was left of it) and this year's hasn't been cut yet due to weather, but it's surely not going to be $5 a bale anymore. Looks like you have a great helper in Mr. William and I laughed when you said you googled him, but I am glad that you did, always better to be safe than sorry. It sounds like you've been very kind to him and I'm sure he appreciates it and works hard for you. You have some excellent pictures in there! Love them! $3 does sound great! Ours is $6.50. I guess we should be happy when we look at what Pony girl is paying! Ouch! We have been getting WAY TO MUCH RAIN. Only have one field off of first cutting. We need a good dry spell. Holy cow Pony Girl! That is crazy for hay! We paided $20/round bale this year and if I buy a square bale to haul with it is $6. Alfale is about $12 I think. Great pics, glad you got it all done! The last pic is a keeper! When I was a kid I always went haying at my grandparents but they just filled their lofts for their own use and never sold any but it still took awhile since they had three big barns and lots of animals ,then we would always play up in the losts too and look for new kittens. Great pics! I just added you! The last photo should be entered in a contest somewhere. It is great. We bought one ton of alfalfa last week for 282 bucks. Over 17 dollars a bale. But these are the 3 twine bales, over 100 lb. bales. 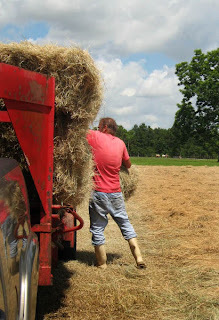 Today my hubby and son are picking up some grass hay out of a field, just like you did, for 4 dollars a bale. These are the 2 twine lighter bales. 18 horses is a lot. I am beginning to think we shouldn't have taken Sweet William, he eats the same as 2 of my other horses!